Technomate Single LNB Satellite Dish, Technomate TM-1’s Colorful Family of Single LNB, Technomate Single LNB We all know that Technomate is one of the manufacturers of classy digital satellite tv network and terrestrial receiver. Recently, Technomate have decided to expand their products, with Ku Band LNB. The choice is really wide: from the single models to octo and even the monoblocks. Are they all as good as the receivers they are supposed to match? Their noise figures (0.2dBand0.1dB) are very promising but we know that only a test with real world signals can prove the value of an LNB. We started with the universal single models LNB Satellite Dish. We will present the other models in separate reports. 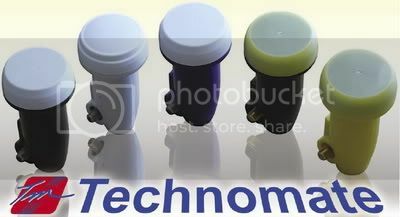 Technomate single LNB are designated as Technomate TM-1. We have got 5 different versions: TM-1 0.2 dB (black color), TM-1 0.2 dB (grey color), TM-1 Super 0.2 dB (blue color), TM-1 Super High Gain (black & gold color) and TM-1 Super High Gain (gold color). The last 2 ones except for having better noise figure,had their F connectors plated with gold. Short form data sheets we found in the packages contained only the specification of the basic TM-1 model. Our test was to reveal what exactly the difference between the versions was. The noise figures printed on TM 1 packages promise very good performance. However, it is not a secret that some manufacturers over specify their products to gain a market advantage over competition. Did Technomate follow this trend? Or perhaps their products are really the state of the art LNBs? We decided to submit them to a really hard test. We took probably the best LNB we had the one that had out performed many other 0.3 dB and 0.2 dB models in our previous tests. At the same time this reference LNB had a high gain (high signal level at the output). Could TM-1’s match it? We chose the Hotbird satellite dish tv fleet on 13° East our signal source. That’s because their transponders are spread all over the whole Ku-Band in both polarizations. The noise performance of the 0.2 dB versions of TM-1’s is shown in figure1and2. TM 1 0.2 dB Super model (the blue one) is surprisingly good. It defeated our reference device in almost every point of the Ku-Band! The grey model was at par being sometimes above and some-times below our reference LNB. Only the black TM-1 looked slightly worse. The higher the gain of the LNB the higher its output power should be for the given signal. 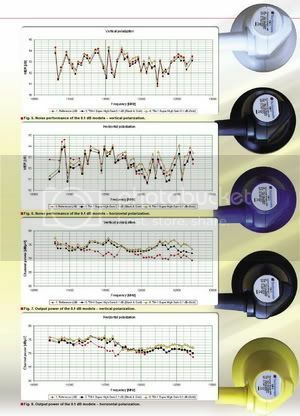 The results for the 0.2 dB TM 1 versions are shown in figures 3 and 4. And again the blue model (Super TM-1) was the leader. Our reference LNB was no match for it. The basic Technomate TM 1 models had lower gain but still sufficient enough for the regular reception system (except for the ones using really long cables or a lot of distribution devices). Super TM-1 was really a top performer. Having so perfect results with 0.2 dB Super TM-1, we doubted if the 0.1 dB Super High Gain version could deliver anything better. 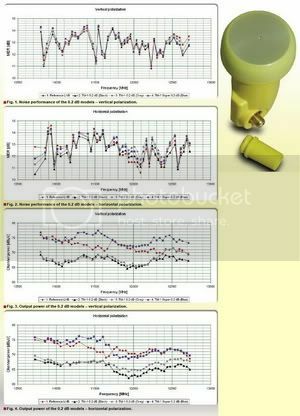 As you can see in figures 5 and 6, the noise performance of both models was better than our reference. However, if you compare them with the Super TM-1 (the blue one) presented in figures 1and 2, they are practically the same. And what about the gain? The output power related directly to the gain is presented in figure 7 and 8.Also here, the 0.1 dB Super High Gain TM-1’s were better than our reference. The golden model was visibly better than the black & gold one but only slightly better than the 0.2 dB Super TM-1. If we were to order the Technomate Single LNB Satellite Dish versions starting from the best one, it would be:1. TM-1 Super High Gain 0.1 dB (gold color) 2. TM-1 Super 0.2 dB (blue color)3. TM-1 Super High Gain 0.1 dB (black and gold color)4. TM-1 0.2 dB (grey color)5. TM-1 0.2 dB (black color). However keep in mind that while the golden model is an absolute top performer and probably the best satelite tv LNB we ever tested, even the black one version is in the high class among the modern today’s devices. You won’t regret the money if you buy one of them!